Two months of full competition on the Waiheke run and it has certainly not been without hitches and newbie pains. The Explore Centurion boat is performing below par due to diesel engine problems, taking 40-45 minutes to get there, causing the Explore evening rush hour timetable to be amended. The 5:15 ex-AKL now sails at 5:35 and if you counted on getting the Fullers bus meeting the 5:30pm Fullers service at Matiatia, you are out of luck as you can see the buses pull up the hill to Oneroa before you have docked. I guess Fullers can't believe its luck sticking it to all you apostates leaving the Fullers Death Star. Hopefully, the new Explore boat will be in service soon so Centurion can be retired to back-up service. Also, the precipitous drop in diesel prices has yet to show up in a drop in fares - watch the reverse not be the case in the future, of course. Passengers need a fares war sooner rather than later. We've been waiting for 14 years now. Bring it on. For years we have campaigned for an end to the Fullers Ferries monopoly on the Waiheke Island service. And all of a sudden, two competitors have turned up in the same weekend. Welcome Explore, which will provide a 7 day service (although not very late at night, and also no island bus service), and Sea Link, which only runs at weekends for tourists. All also offer very different fare structures and deals, check their websites, which makes it a little byzantine to figure out what is best for you and your travel needs. A proper fare integration in the form of monthly flat rate Hop Passes for all buses, trains and ferries, is still a long way off. But it's a start and prices have started falling already, as they should in a proper market. 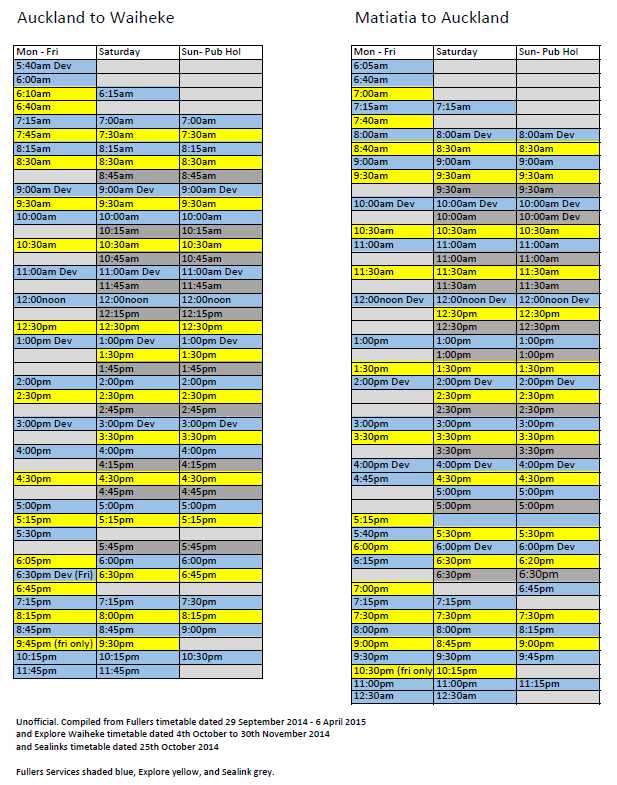 Here is the full current timetable for sailings by all operators. Matiatia will be busier than usual - and that's even without the proposed marina clutter.